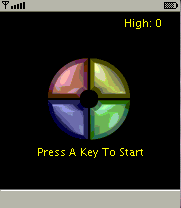 This is actually a rewrite of my old Java Memory game (a rip off of the old electronic Simon Says game) which was a rewrite of a game I wrote when I was 15 in AmigaBasic. You can take a look at the Java applet version that will run in your web browser here: http://www.mikekohn.net/java/memory/. Anyway, I tested this on my SonyEricsson T610 phone that I got in Sweden. The T610 supports MIDP 1.0 and AMR sound files instead of WAVS, which is quite odd, so I made two versions. The main version is MIDP 2.0 and the sounds are wav files so it should run on any phone that supports MIDP 2.0. The T610 version will run on any phone that supports only MIDP 1.0 with AMR sound files. How To Play: Press any button to start the game. The game has 4 "lights" which all make their own distinct sounds. The computer will create a random song using these lights and tones and your job is to repeat the same tones. You will use the numbers 1, 3, 7, and 9 to light up the appropriate light (and play the tone that goes with that light). The melody will start out first with 1 note, then if you get it correctly it adds another tone, and then another until you mess up. To exit, you may have to hold down the back button on your phone.